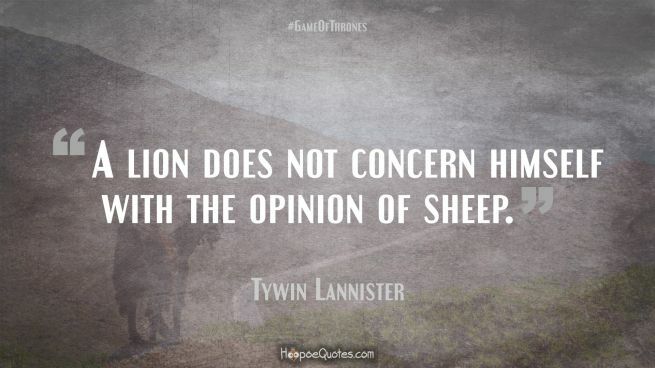 When I read this Game of Thrones Quotes collection, I've asked myself which qutes from the show are my favorite. 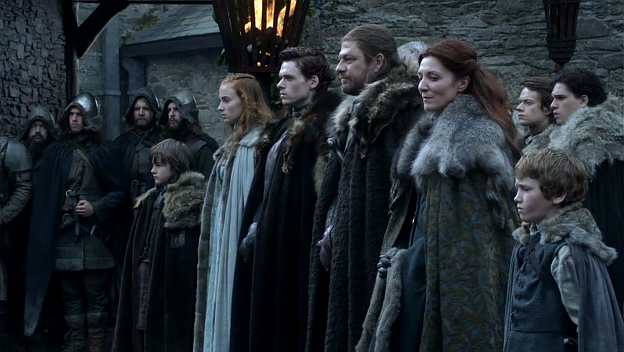 And of course, they all come from the House Lannister. House Lannister is one of the Great Houses of Westeros, one of its richest and most powerful families and oldest dynasties. They used to rule the Westerlands as the Kings of the Rock before swearing allegiance to the Targaryen family. They have since served the Targaryens and now King Robert Baratheon as the Wardens of the West. 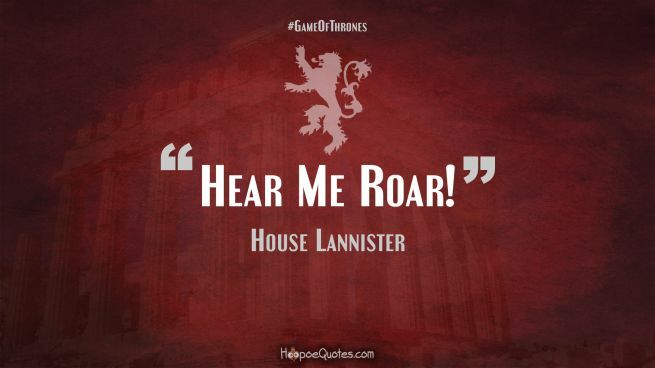 House Lannister’s symbol is a golden lion on a crimson background, and their house motto is “Hear Me Roar!”. 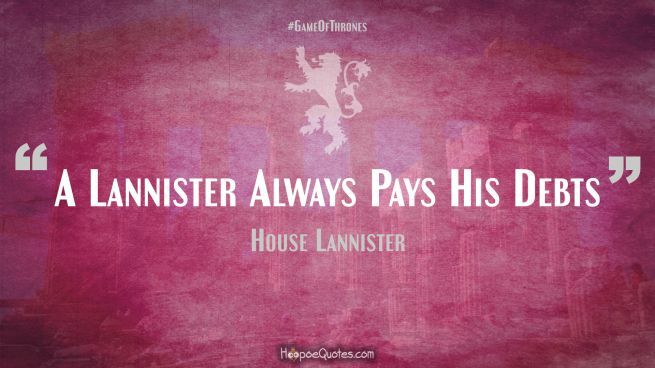 Their unofficial motto, which is as well known as the official one is “A Lannister Always Pays His Debts”. Lord Tywin Lannister, the head of the family. His daughter, Queen dowager Cersei, widow to the late King Robert Baratheon. His eldest grandson, King Joffrey Baratheon. His granddaughter, Princess Myrcella Baratheon. His youngest grandson, Prince Tommen Baratheon, heir to the Iron Throne. His eldest son, Ser Jaime Lannister, of the Kingsguard. His youngest son and legal heir, Tyrion Lannister, a dwarf. Ser Kevan Lannister, Tywin’s younger brother. Married to Dorna Lannister. Lancel Lannister, Kevan’s eldest son and heir, squire to King Robert Baratheon. House Clegane of Clegane Keep. House Lefford of Golden Tooth. Military strengthHouse Lannister can raise approximately 60,000 men in a relatively short period of time. As the richest house, the Lannisters’ forces are among the best-equipped in the Seven Kingdoms, though House Tyrell commands larger numbers. The Lannisters also command a modest fleet, berthed at Lannisport. 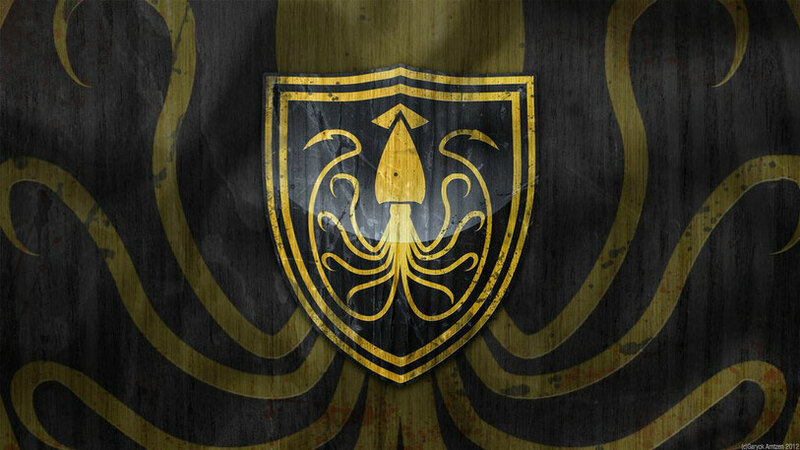 The fleet was largely destroyed at anchor during the Greyjoy Rebellion in a pre-emptive strike led by Balon Greyjoy’s brothers. 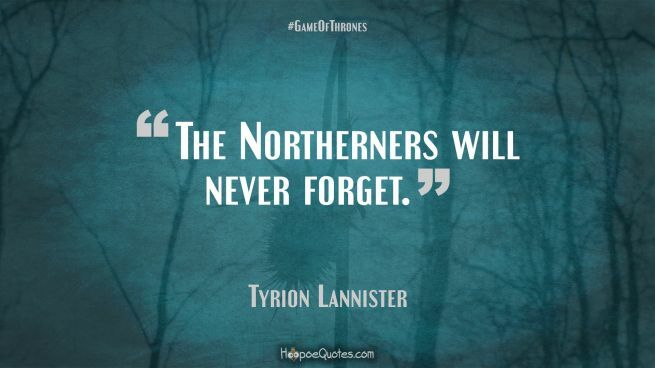 You can allways visit this post about Game of Thrones sayings, if you need more of the quotes. "Any man who must say, 'I am the king' is no true king. I'll make sure you understand that when I've won your war for you." "You can drink. You can joke. You can engage in juvenile attempts to make your father uncomfortable. But you will do your duty." "Have you gone soft, Clegane? I always thought you had a talent for violence. Burn the villages, burn the farms. Let them know what it means to choose the wrong side." "There, you see? You will wed her, bed her, and put a child in her. Surely you're capable of that." In the Song of Ice and Fire novels, House Lannister was established many thousands of years prior to the books’ opening by a trickster-hero called Lann the Clever, who tricked the powerful Casterly family into abandoning their stronghold of Casterly Rock, which the Lannisters took for their own. The Lannisters have ruled the region known as the Westerlands ever since, getting rich of the many gold and silver mines in the western hills and mountains. During Robert’s Rebellion, the Lannisters sat out most of the war, refusing to heed the calls of King Aerys II Targaryen to aid him in crushing the rebellion. After the rebel victory at the Battle of the Trident, the Lannister army marched to the relief of King’s Landing but, instead of helping defend the city, they brutally sacked it, killing King Aerys and his grandchildren. Robert Baratheon publicly forgave the Lannisters their actions and accepted their allegiance, marrying Cersei Lannister in thanks for Tywin’s assistance. However, Eddard Stark saw the Lannister action as betrayal and murder, and has not trusted them ever since. Anyways, if you're hungry for more Game of Thrones quotes, check out this Beep Blog. See you around! The pilot is the first Game of Thrones episode recorded, but was never broadcast. The recordings took place between October 24 and 19 November 2009 in Northern Ireland and Morocco. The pilot was directed by Thomas McCarthy. Will the pilot ever be transmitted or released, it is not known. It is said to have cost between 5 and 10 million dollars. Another difference is what is included in the show. Scenes for the pilot were filmed in Scotland and Morocco The Scottish Doune Castle served as Winterfell. Most scenes with Daenerys were recorded in Morocco, these are scenes used by Ridley Scott’s Kingdom of Heaven. In the official first episode, these locations are not included. The scene in the crypts beneath Winterfell where Robert Baratheon Eddard Stark asks to be his Hand of the King. The scene between Eddard and Benjen Stark in which they discuss the execution of the Night’s Watch ranger. House Targaryen is one of the former Great Houses of Westeros and the previous ruling royal house of the Seven Kingdoms, before House Baratheon took the Iron Throne. House Targaryen’s symbol is a three-headed red dragon on a black background and their motto is “Fire and Blood”. Once a noble family of the vast Valyrian Freehold, an empire spanning most of the eastern continent, the Targaryens were given control of the island of Dragonstone in the Narrow Sea some centuries ago. After the obliteration of Valyria in the Doom, the Targaryens launched a devastating invasion of Westeros using three dragons to spearhead their attack. In a short period of time six of the seven formerly-independent kingdoms had surrendered to the Targaryen leader, King Aegon I, unifying the continent under his rule. The last hold-out, Dorne, joined the kingdom through a political and marriage alliance some two centuries later. The Targaryens adopted the religion and many of the customs of Westeros, but two old Valyrian customs they continued to perform in defiance of public disapproval: Targaryen princes and kings were allowed to have multiple wives and Targaryens were allowed to marry brother to sister, something considered an abominable sin elsewhere in Westeros. During the increasingly erratic reign of King Aerys II, his son Rhaegar kidnapped Lyanna Stark of Winterfell for reasons unknown. This sparked a massive uprising led by Eddard Stark, Robert Baratheon and Jon Arryn. At the end of this war Aerys and Rhaegar were dead and the Targaryen power-base in Westeros destroyed. Aerys’s youngest two children were taken by Targaryan loyalists into exile in the Free Cities of the east. The Targaryens have some unusual genetic traits, such as their silver-white hair and an apparent ability to withstand higher temperatures than most people. It is noted that in the latter case, Daenerys Targaryen is specifically shown to have this trait whilst Viserys is not noted as possessing it. Due to the constant inbreeding insanity has become a common factor in Targaryens. When they ruled the seven kingdoms it became a bit of joke among the people for a coin toss to be held to see if the child would be “mad or great”. Despite this insanity does not dominate the bloodline with Daenerys seen as the exception while her brother is clearly unhinged. King Aerys II Targaryen, the Mad King, slain by Ser Jaime Lannister at the end of Robert’s Rebellion. His sister-wife Queen Rhaella, also of House Targaryen, died in childbirth. Their oldest son and heir, Prince Rhaegar Targaryen, slain by Robert Baratheon at the Battle of the Trident. Prince Rhaegar’s wife, Princess Elia of House Martell, slain during the Sack of King’s Landing by Lannister armsmen. Prince Rhaegar’s daughter, Princess Rhaenys, slain during the Sack of King’s Landing. Prince Rhaegar’s son and heir, Prince Aegon, slain during the Sack of King’s Landing. Aerys and Rhaella’s second son, Prince Viserys Targaryen, the Beggar King, in exile in the Free Cities. Aerys and Rhaella’s daughter, Princess Daenerys Targaryen , in exile in the Free Cities. King Aerys’s aunt, Princess Rhaelle, married into House Baratheon. Robert Baratheon and his brothers are her grandsons, giving Robert his claim to the Iron Throne that he pursued during the civil war. In the booksIn the books House Targaryen moved from Valyria to Dragonstone, apparently in fear of a prophecy predicting the destruction of Valyria a century before it happened. After the fall of Valyria, the Targaryens stayed on Dragonstone for a hundred years, apparently hoarding the strength of their dragons and debating whether to invade Westeros or to attempt to seize control of the Valyrian colony-states which later became known as the Free Cities. In the event, they chose to invade Westeros instead. House Targaryen ruled Westeros for 283 years, during which time they survived substantial civil wars (including the Dance of Dragons and no less than five Blackfyre Rebellions), plague (the Great Spring Sickness) and even an attempted foreign invasion (in the War of the Ninepenny Kings). They were brought down when the Mad King’s insanity became too dangerous to be ignored. Welcome! I'm Johnny and I will be your guide through noble houses of Westeros. Join me on this travel! Let's explore great houses in Game of Thrones universe. However, whoever is the central character in the end (if it is such a thing in GoT), Houses are what Game of Thrones makes extraordinary. Such a level of political games and realistic portrayal has never been seen in the fantasy writing until George RR Martin. Most of the readers and fans of the show love House Stark the most. And nobody can blame them, it represents all the ideals that humanity should be striving for. At least in theory. They often fail greatly when faced with reality of the politics. That's why others love Lannisters more. Some even idolized Tywin. Whichever house is your pick, I'm sure you have good reasons for that choice. I have my favorites, but I will try to cover most of them. So, welcome to my blog, and let us learn something new about this great GoT Universe.